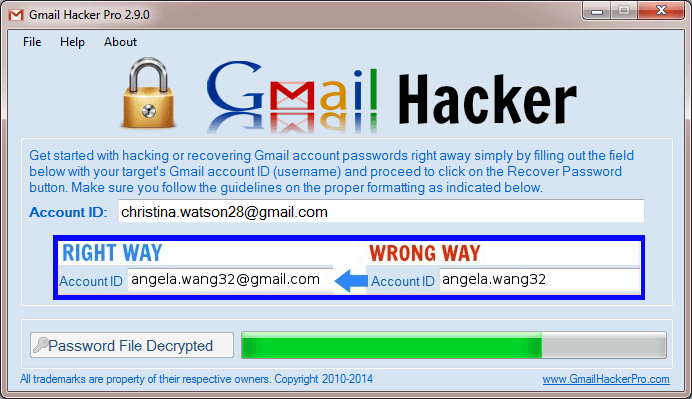 Gmail Password Hack Tool provides you the latest technology to use the safe and appropriate method of hacking any Gmails accounts by getting access to its login password. As we know that hacking is illegal to attempt but in some instant, it becomes crucial to hack the Gmail accounts to get your objects. By using this application you will get guaranteed results to hacks anyone criminal through protected servers. It is officially recommended by the google to use this hacking program. This is most cheap and easy to use tool to get access to anyone’s personal information. For using this program, you do not require any professional hacking gmails accounts password in few minutes. Hacks the unlimited number of Gmail account. Safe hacking for secure passwords. Recover multiple balances with the software support. IP and Mac address hidden at all times. Download this tool from below link. Open this tool and put Gmail ID the one you want to hack.